Legal Stuff: This site contains affiliate links. If you purchase a product or sign up for a membership, I may receive some small compensation. 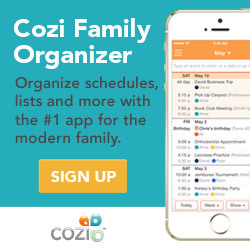 I’m excited to announce that I’m now a member of a new affiliate program for Cozi, the family organizing app and website! I’ve been waiting to join this one for a while because Cozi has helped keep my family on time (or at least as close to on time as my family is capable of) for all of the appointments, games, activities, and more for a few years now. We really would be lost without it. This post is going to sound like a commercial, but I can’t tell you how much we rely on this. Between my wife and I working and three kids all involved in activities, then throw in any appointments for the doctor, dentist, haircuts, birthday parties, church, etc. and Cozi has been a lifesaver for us. Unfortunately, we used to miss appointments on occasion, or suddenly remember them at the last minute so that we had to scramble to get there. At one time, I was pretty sure the lady who cuts my wife and the kids’ hair was going to ban us because we missed so many appointments. That’s where the the scheduling feature of Cozi comes in. Assign everyone a color and you can easily see on the calendar which family member each appointment applies to. Then let Cozi email your calendar to you every week. Cozi also has a shopping list feature, a journal, to-do lists, and recipes. There is an app available for Android and Apple as well as a website where you can manage everything. Here’s how we use the shopping lists. We have lists for Groceries, Target (which we’re using less lately because we try to buy fewer things and because we shop online more), Hardware (because I can never remember things like what size furnace filter I need), and Online (which has turned into more of a wishlist). Did I mention that the shopping lists update immediately? One of my favorite things to do if I know my wife is out shopping, is to start adding random things to the list. She never falls for it though. She’s too smart for me. Then there’s the To-Do lists which I’ll admit we don’t really use for their intended purpose. Mine currently has only one item “Call those bastards at the cable company”. Instead, we have things like a list of local thrift stores and their hours, a list of things we wish we would have brought camping this past summer, and the keyless entry codes for our cars. The best part about Cozi is that it’s free as long as you don’t mind some advertisements. If you don’t like ads or you really need some of the premium features you can pay an annual fee. We’ve gotten by with the free version for quite a while now though. One final note and I’ll shut up. Cozi, like any other organizer, is only useful if you take the time to set it up and actually use it. One of the things we did was to hang a simple one-week dry-erase calendar in our kitchen. Every Sunday afternoon, my wife looks at Cozi and updates the entire week using different color markers. This allows everyone to see the calendar so that the kids can help keep us on track too. OK. Thanks for reading. Now go sign up for Cozi and let me know how you like it.